Join the HDTV revolution! Your flat panel TV can do a lot more than play movies and television shows! When your TV is off, a large, unappealing black void remains on the wall. 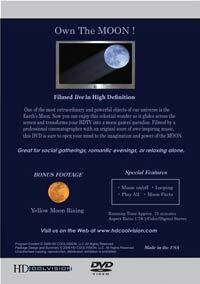 But with this DVD you can transform your HDTV into a moon gazer's paradise. Now you can enjoy the celestial wonder of the Moon as it glides across the screen in a beautiful scene of the rising moon. 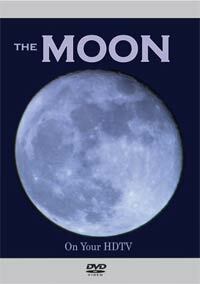 Live footage of the moon filmed by a professional cinematographer with an original score of awe-inspiring music, this DVD is sure to open your mind to the imagination and power of the MOON. Also Great for Businesses: Spas, Physician and Dental Offices, Yoga Classrooms, Clubs and more� Your copy is licensed for up to four screens at a single location! It is best viewed on High Definition flat panels and flat screen TVs, but it also works on computer monitors. We know you will love this DVD and how the Moon transforms your otherwise idle HDTV screen, or return it within 30 days for a full courteous refund. This guarantee effectively converts your purchase into a 30-day risk free trial. So you have nothing to lose!